Frugal & Fabulous: Review: Pro-15 The Perfect Probiotic! Review: Pro-15 The Perfect Probiotic! I had some terrible luck with colds this year. I had two that turned into raging sinus infections and another that led to a double ear infection. What does that mean? Antibiotics. Which wreaked havoc on my stomach! The only thing that saved me was probiotics. If you've never taken probiotics before, they are pills that improve your digestive system and your intestinal health. 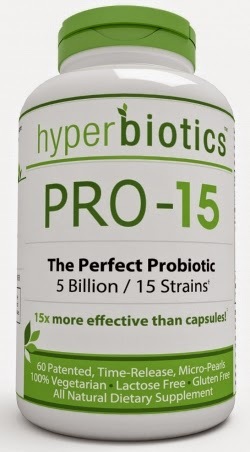 One of my favorite probiotics is HyperBiotics The Pro 15 - The Perfect Probiotic. The Pro 15 is a small pearl that is easy to swallow and easy on your stomach. It works great and is available on Amazon - which I love! This is the #1 Recommended Best Probiotic Supplement. The bottle comes with 60 time release capsules, so you only have to take them once a day and still get the full effect! They are lactose and gluten free and are safe for children or adults. Verdict: I really like the time release pearls because before I was taking two or three regular pills throughout the day and either I would forget, or it just wasn't as convenient. After taking The Pro 15 pearls I felt great and had no stomach issues! I recommend these to anyone for everyday use, or if you have gastrointestinal issues.